I joined a Twisted Fiber Art yarn club. Aiiieee! The inspiration photos for the current round were too much for me. 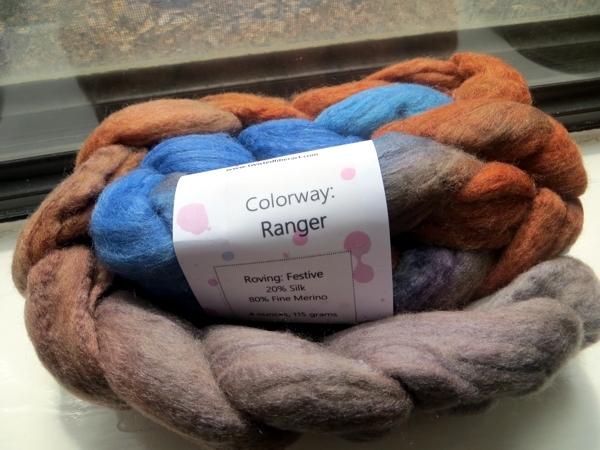 I shouldn't have done it, and I kind of regret it, but if I had to do it over I would choose the regret and the fiber over practicality and no fiber, because I do love getting woolly surprises in the mail. Also, things are finally settling into place around here. It took me a while to notice and then even longer to feel that I could ignore the renovation and just live for a bit. And eventually I noticed it was the end of June, that July was almost here and that I could do the Tour de Fleece again. I was disappointed not to be able to do it last year, and I remember wanting so much to take my wheel upstairs to the rooftop terrace and just sit for an hour or so enjoying the views. Maybe I'll do it this year, since we're spending a second summer in our temporary condo home after all, but I'm not going to pressure myself. It's enough just to make a start. 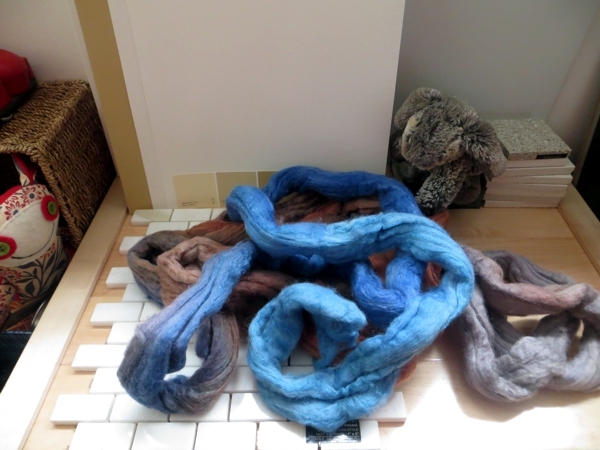 As I tore this newly-arrived fiber into three sections I remembered that I'd been in the habit of tearing braids into four, for two two-ply cakes of yarn. 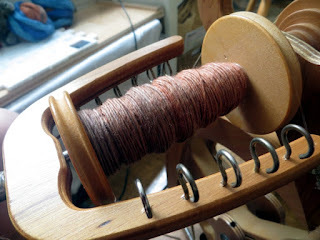 One long string of three ply is more of a favourite of mine for knitting, but my wheel doesn't let me hold enough yarn to make that possible - there's always a break at about the 2/3 point, which never gets less disappointing. I considered tearing them up again for six sections - for either a pair of three-ply cakes or a trio of two-ply cakes, but didn't. I wonder if that was a mistake? Eh, it doesn't matter. Spinning again after all this time was like riding a bike, which - now that I think of it - is what non-textile people assume I'm talking about when I mention spinning. The muscle memory was still there. But it felt odd, too. My hand got sore and I had to stop several times to take a break, and the fiber broke more than once because I'd sent the tension too high. I was glad to be back though. I love watching the singles start to build up, especially when they're so lovely and even. 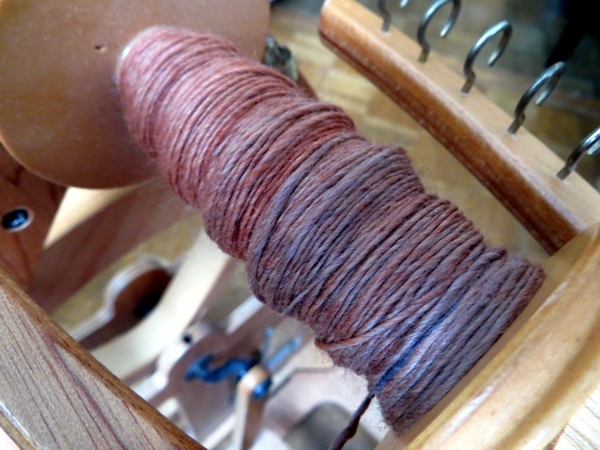 This is a Festive base - 20% silk to 80% merino - so it kind of glistens in the sunshine and makes me feel like I'm better at this than I really am. One down, three to go. 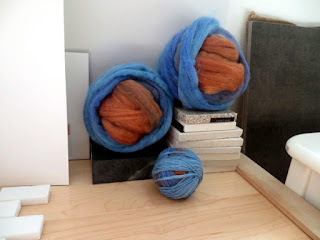 It's so nice to introduce my interior finishing obsession to my yarn obsession. 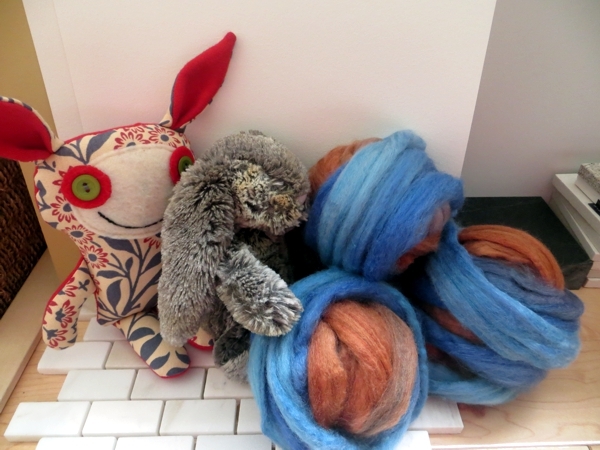 I wonder whether they will learn to coexist for the rest of the decor stage, or whether I will still have to prioritize? Either way, life feels pretty good around here right now. Hope it does for you, too. Have a safe and wonderful weekend everybody - see you Monday!